The Big Island of Hawaii is full of rich superlatives, from the tallest mountain in the world (Mauna Kea, at 33,000 feet from its toes on the ocean floor to tip) to the world’s most active volcano, and much more. Notable is the fact that of the planet’s thirteen climate zones, The Big Island of Hawaii sports eleven! In order to experience all eleven climate zones anywhere else in the world, you’d have to travel from Alaska to Costa Rica, over 4,800 miles. On the Big Island, you can do the whole trip in 190 miles and one spectacular day! 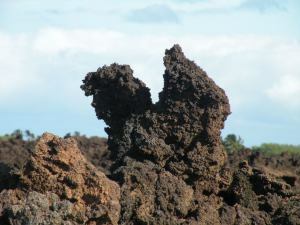 Lava takes many fascinating forms…can you see a rooster in this one? Look for this proud fellow on the drive into Mauna Lani Resort. You’ve heard of storm chasers? Here you can do a “climate-chaser” tour. Beginning on the South Kohala Coast, at Waikoloa or Mauna Lani, you’ll drive clockwise around the island. 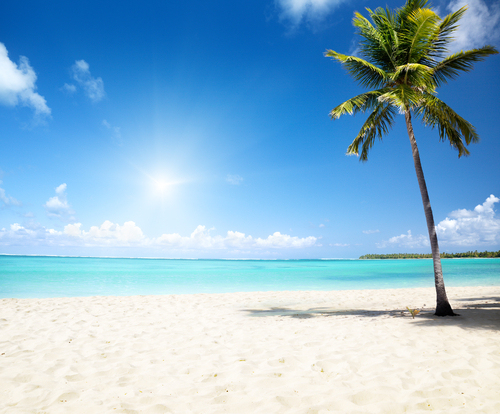 While the resorts are stunning oases in themselves, you may have noticed that the surrounding area is desert-like, stark, dry, arid, averaging 84 degrees and only 8 inches of rain per year. 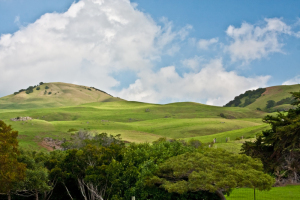 During your next two-hours, you’ll pass through the velvet green hills of Waimea, Paniolo country, land of cowboys and ranching, which averages 60 inches of rain with temperatures ranging from 50 to 85 degrees — and on through deep, stunning gorges into tropical rainforests dotted with waterfalls just outside of Hilo. 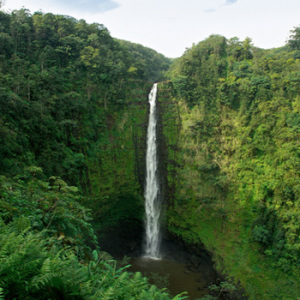 You can stop at Akaka Falls, and Laupehoehoe, as well as the Botanical Gardens, a lush rain forest preserve with tropical vegetation to live for! DO stop by to visit the parrots, and be careful what you say, they will laugh at you! The orchids there are also well worth the time spent to enjoy. Hilo is a modest town, the most densley populated on the island, and is usually soggy with an average 115 inches of rain per year. If you DO happen to hit Hilo on a sunny day, you’ll find it to be one of the most beautiful places on the island. Hilo is home to the University of Hawaiʻi at Hilo, ʻImiloa Astronomy Center of Hawaiʻi, as well as the Merrie Monarch Festival, a week-long celebration of ancient and modern hula which takes place annually after Easter. 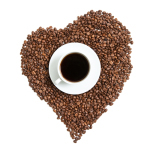 Hilo is also home to the Mauna Loa Macadamia Nut Corporation, one of the world’s leading producers of macadamia nuts. Your next destination would be Volcanoes National Park, at 4,000 feet elevation, with temperatures ranging from 48 to 73 degrees, and rainfall from a mere 10 inches to more than 100 inches, all within the bounds of the park! 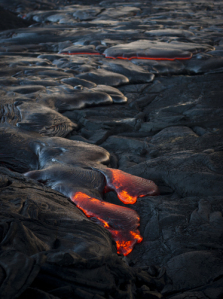 Not to mention the liquid molten lava pouring into the steamy sea. If you’re on a full-day adventure, don’t miss the videos at the Visitor’s Center. Twenty minutes, and free, they are not to be missed! Leaving the Volcano, you will enter a warmer, tropical climate, one of the most unique climate zones in all of Hawaii – Kona Coffee Country! Not to mention vanilla and chocolate. The Island of Hawaii is the only place in the United states to grow all three of these delectables. What more could you want? All the best food groups grown on one island! In Hilo, be sure to drop by Sharkey’s for delectable tastes of all three, grown by Sharkey himself! And now for the other-worldly part – who would believe that you would need snow parkas, hats and gloves in Hawaii?! You certainly will, especially in the winter months on the peak of Mauna Kea, where we just spotted this year’s first dusting of snow. At a little more than 13,000 feet above sea level, Mauna Kea Summit offers a magnificent view of the surroundings areas from the mountain to the ocean. 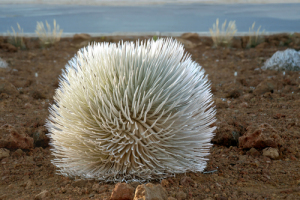 Look for the looking frosty silver leaves of the rare Silver Sword plant in the setting sun. There are quite a few at the heiau behind the Visitor’s Center. You WILL want to stop at the VC on your way to the top to make a pit stop, give yourself a few minutes to aclimate to the high altitude, and maybe visit the heiau. 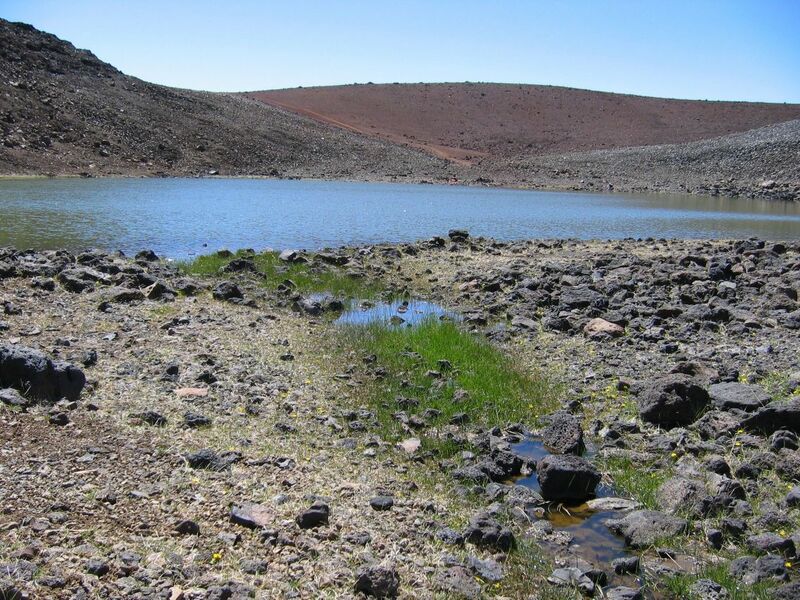 If you can get there early enough, you could even hike to Lake Waiau, the permafrost lake atop Mauna Kea. If you do take this hike, please educate yourself as to the sacred nature of this site, and approach with the reverence you would afford any other holy place. The entire Mauna a Wa Kea is held in utmost reverence by the Hawaiian people, and they can only hope that visitors proceed with respect. Sunsets and sunrise are both spectacular from the mountain peak, and one can stand there for just about as long as it takes the sun to go down before hopping in the car and wheeling down to the visitor’s center for hot chocolate and star gazing. Ask the attendants, and they will show you how to take a picture of what they find in the telescopes. It’s the perfect ending to a perfect day, and where else could you say you had visited eleven climates in one day?